Bob Murray of Merritt Boat & Engine Works writes in to say that the owners of the 51.2m Schweers superyacht Jamaica Bay have reduced her price as they're taking delivery of a new yacht soon and want this one sold. Launched in 1987 as Leocrie III, she was bought and renamed by her current owners in 1999. Jamaica Bay had a major $4 million refit in 2007 and is currently lying in Genoa before overwintering in Malta from the middle of November. 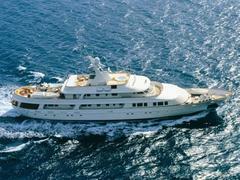 Accommodating 12 guests in six staterooms, her price has come down from $20 million to $15.75 million.